The following excerpt was taken from “COME INTO MY TRADING ROOM, A Complete Guide to Trading” by Dr. Alexander Elder. This is an interesting momentum based system. You can find this book at Amazon.com and it has lots of good info on various subjects. I designed this system to identify the inflection points where a trend speeds up or slows down. The Impulse System works in any timeframe, including intraday. It provides buy and sell signals, but leaves it up to you to select good markets, tweak parameters, and supply the discipline. Choose an active market whose prices swing in a broad channel. What happens if you make a C trade and grab only 10% of a channel width? This result is not too bad if the channel is 20 points wide, but a C trade is an exercise in futility if the channel is only 5 points wide. Chase fat rabbits, don’t waste your time on skinny ones. The Impulse System combines two simple but powerful indicators. One measures market inertia, the other its momentum. When both point in the same direction, they identify an impulse worth following. We get an entry signal when both indicators get in gear, but as soon as they stop confirming one another, we take that as an exit signal. The Impulse System uses an exponential moving average to find uptrends and downtrends. When the EMA rises, it shows that inertia favors the bulls. When EMA falls, inertia works for the bears. The sec- ond component is MACD-Histogram, an oscillator whose slope reflects changes of power among bulls or bears. When MACD-Histogram rises, it shows that bulls are becoming stronger. When it falls, it shows that bears are growing stronger. The Impulse System flags those bars where both the inertia and the momentum point in the same direction. When both the EMA and MACD-Histogram rise, they show that bulls are roaring and the uptrend is accelerating. When both indicators fall together, they show that bears are crushing the market. Those indicators may stay in gear with each other for only a few bars, but that’s when the market travels fast—the impulse is on! Before you rush to apply the Impulse System to your favorite mar- ket, remember how Triple Screen analyzes markets in more than one timeframe. Select your favorite timeframe and call it intermediate. Multiply it by five to define your long-term timeframe. If your favorite chart is daily, analyze the weekly chart to make a strategic decision to be a bull or a bear. Use a 26-week EMA, the slope of weekly MACD- Histogram, or both, on the weekly chart. Once you’ve defined the long-term trend, return to your daily chart and look for trades only in the direction of the weekly. The Impulse System uses a 13-day EMA and a 12-26-9 MACD-Histogram. The EMA, tracking market inertia, is a little shorter than our usual 22 bars, mak- ing the system more sensitive. When the weekly trend is up, turn to the daily charts and wait for both the 13-day EMA and MACD-Histogram to turn up. When both inertia and momentum rise, you have a strong buy signal, telling you to get long and stay long until the buy signal disappears. When the weekly trend is down, turn to the daily charts and wait for both the 13-day EMA and MACD-Histogram to turn down. They give you a signal to go short, but be ready to cover when that signal disappears. Some technical programs allow you to mark price bars with different colors. Make them green when both the EMA and MACD-Histogram rise, and red when both indicators fall. Don’t mark the bars where the indicators point in the opposite directions. This lets you easily see signals at a glance. When a cowboy at a rodeo hops on the back of a wild bronco, how long does he ride it? Twenty seconds, 35 maybe, 50 if he is good and lucky. Wild momentum trades don’t last long either. Try to hop off while you’re still in the money. The time to buy into a momentum trade is when all your ducks are in a row, that is, when the weekly trend is up and the daily EMA and MACD-Histogram are rising. Hop off as soon as a single indicator turns down. Usually, daily MACD-Histogram turns first as the upside momentum starts weakening. When the buy signal disappears, sell without waiting for a sell signal. Reverse the procedure in downtrends. A momentum trade on the short side starts when the weekly trend turns down and the daily EMA and MACD-Histogram also fall, showing that the downward momen- tum is accelerating. Cover shorts as soon as one of those indicators stops giving a sell signal. The most dynamic part of the decline is over, and your momentum trade has fulfilled its goal. The Impulse System encourages you to enter cautiously but exit fast. This is the professional approach to trading, the total opposite of the amateurs’ style. Beginners jump into trades without thinking too much and take forever to get out, hoping and waiting for the market to turn their way. You must be very disciplined to trade this system because it is hard to place an order when the market is already flying, but even harder to quit while you’re ahead without waiting for a reversal. You are not allowed to kick yourself if the trend continues after you get out. Do not touch this system if you have the slightest problem with discipline. Green price bars show that the bulls are in control of both trend and momentum as both the 13-day EMA and MACD-Histogram are rising. A red price bar indicates that the bears have taken control because the 13-day EMA and MACD-Histogram are falling. A blue price bar indicates a split or equilibrium between buying and selling pressure. The Elder Impulse System can be used across different timeframes, but trading should be in harmony with the bigger trend. Elder recommends setting your trading timeframe and then calling it intermediate. Multiply this intermediate timeframe by five to get your long-term timeframe. Traders using daily charts for an intermediate timeframe can simply move to weekly charts for a long-term timeframe. The choice is not as clear cut for smaller or longer timeframes. A little judgment is required. Traders using 10-minute charts to chart their “intermediate” timeframe can use 60-minute charts for their “long-term” timeframe. Investors using weekly charts can base the bigger picture on monthly charts. Once the trading timeframe is decided, chartists can then use the longer timeframe to identify the bigger trend. This can even be accomplished using one chart. 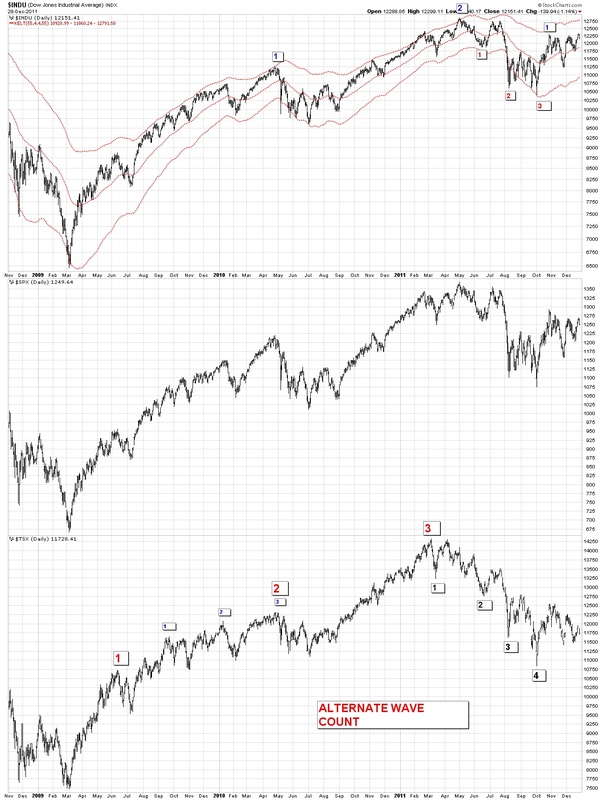 Chart 2 shows daily bars with the Elder Impulse System and the 65-day exponential moving average, which is five times the 13-day EMA. The long-term trend is considered up when SPY is above the 65 day EMA or when MACD (1,65,1) is positive. In the daily chart above, we are using the MACD(1,65,1) indicator to show us the weekly trend. If it is above zero, the weekly trend is up. If it is below zero, the weekly trend is down. Given that, then the first three green arrows on the chart show valid daily buy signals (i.e. new clusters of green daily bars). Note, however, that the first couple of red bars on the chart are NOT valid sell signals in this case because the weekly trend is still positive (according to the MACD we are using). The red arrow shows the first valid sell signal that happens after the weekly trend turns down. 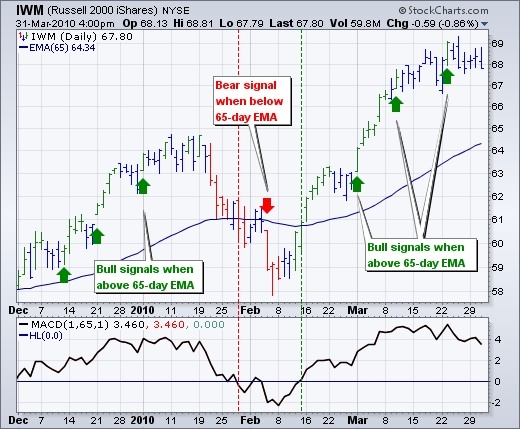 Similarly, the weekly trend must turn positive again before valid buy signals are given (as indicated by the last three green arrows on the chart). Large step two up ended in May 2011. 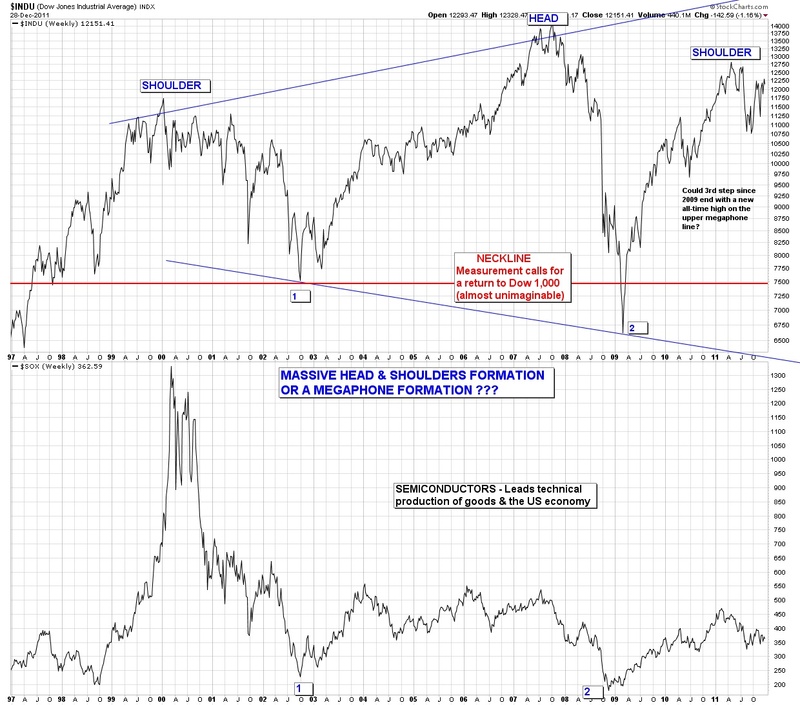 We have entered a very wide swinging market (megaphone formation) similar to that of 1966 to 1974. During that era we had three bear markets with two intervening bull market rallies. Each bear market had a lower low than the previous bear. The intervening bull market rallies saw new all time highs before the next bear market began. We began a long term bull market in March 2009. Each subsequent min-bear market will result in higher lows than the prior major low. In the head and shoulders formation the measurement calls for a bottom around Dow Jones Industrials 1,000. This is almost an unimaginable event regarding the possible fundamentals to create this scenario. If this did happen, everything that could go wrong would have to go wrong. The reasons range from the absurd to the absurdly absurd. This scenario is so dark that it doesn’t seem possible but nevertheless, the head and shoulders formation is there and will be waiting until we pierce the all-time highs of October 2007. Hopefully we will never have to think about worst case scenarios other than to have a good laugh at them presently. I have used a technique of his that I found in an obscure reference in one of his reports. It was only mentioned once and never again. I believe that he used this tool extensively and never told the world it’s importance. Prior to my finding this tool, I had been trying unsuccessfully to find a different way to chart the market. When I read about his technique I knew instantly that this was exactly what I had been seeking. I have charted this method back to 1939 and found it to be very useful. There is no mention of it in the reports that I posted below as I have deleted any reference to it. It’s a super secret indicator and I’d have to kill you if I told you about it. Edson Gould was truly a legend in his own time. It’s too bad that today most people have forgotten or never heard of him or his discoveries. Below you will find only the first page of these reports. A teaser is what you might call it. The rest of the reports are available upon request. This is a man that deserves to be remembered throughout technical analysis market history. It was also my most important discovery, for it explained the irrational volatility of markets that had mystified me in my early years. During those early years I found nothing worked in predicting these irrational market swings. But the fog lifted after reading this report and I began to understand how to begin predicting the market. With companies failing to pay dividends commensurate with their earnings, this indicator has failed. As the market climate continues to deteriorate in the coming years, I would expect dividends to return to their former levels and this indicator will once again become useful. Prior to the late 1990s, it had 100 years of success. This was a remarkable forecast in 1977, where the Dow Industrials had never been higher than 1,000. NO ONE predicted a rise of this magnitude in 1977. Most were waiting for a resumption of the bear market. As part of the 1977 to 1982 forecast: On Wednesday August 4, 1982 I went long the market for the first time in months. By Friday, August 6 I was worried that I had made a mistake as I was deep in the red (I was long the Kansas City Stock Market Contracts). The Kansas City Stock Market Contract was the first of the stock index contracts (February 1982). It was based on the Value Line Arithmetic Index, margin requirement were quite low, and it had a multiplier of 100 times the Value Line Arithmetic Index, which meant the leverage was very high. On Friday (Aug 6), my wife and I went to dinner and I told her my tale of woe and whether I should sell my long positions. I explained that my key indicator had reversed and continued higher on Thursday and Friday but the market had continued lower. Since the key indicator was usually correct, we decided to stick it out for a few days more (I was crazy in those days). My key indicator was mentioned by Gould only once in his market letters. If you didn’t catch its importance, too bad, because he only gave you a peek. Prior to Gould writing about this indicator I had been looking for one that had similar characteristics without success. Thus when Gould wrote about it, I recognized instantly that I had struck gold. I have modified this indicator slightly and researched it back to 1939. This was a lot of work as it was before computers and online data (remember when Barrons was available only on paper, still is for the distant past). Meanwhile on Monday August 9, 1982 the market took off like a rocket and never looked back. I skyrocketed out of the red and had a big profit. In August 1982 the only people that were bullish were Edson Gould, Robert Prechter and myself (probably a couple of others but I didn’t know them). Everyone else was extremely bearish. It was a perfect example of crowd behavior. In this blog a warning of an impending bottom (or top) is often issued well in advance of the formal buy or sell date. This allows thoughtful consideration prior to a formal action signal. To get a sense of how this works, you should read a few days prior to a formal buy/sell signal. I often buy/sell in my personal account based on the early warnings.